Hills of San Francisco, DIY spots, brilliant adverts, blood, concrete and vagrancy are just a few of the defining characteristics of Julien Stranger's skateboard company, Anti Hero. Host to legends such as Stranger himself, John Cardiel, Jeff Groso, Tony Trujillo alongside modern greats such as Grant Taylor, Robbie Russo and Raney Beres. 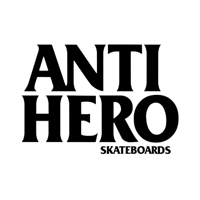 Anti-Hero's graphics, team and videos speak more about it's ethos than words do. We're stocked to be stocking the Volcom x Anti Hero Collection, designed with conquest in mind and built with a passion for punishment. The Volcom x Anti Hero Collection features the finest quality materials together with design input from Volcom & Anti Hero Team Riders; Grant Taylor, Chris Pfanner and Daan van der Linden.